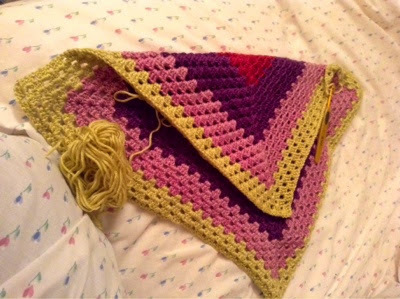 A few years ago I collected the art of crochet intending as you do to learn to crochet by making the blanket, I collected it for about a year, this was a weekly part works so I got a ball of wool each week, I know the basics about crochet as I am self taught I have used it as edging on knitting. I decided to wash the bedding in my dog's beds, but then when I pulled it all out I decided I was not going to assult my washing machine with all the dog hairs I managed to fill two bin bags, so now they have nothing to curl up in, I am rooting in the wardrobes for old jumpers and I thought why not use up some of that wool, so I have started a blanket feeling quite pleased with myself but the action of crocheting is making my wrist ach a bit. Good luck with your new project - I am sure that the dogs will love it! Awesome use of those balls of yarn. I gave up on those magazines because I didn't like the quality. 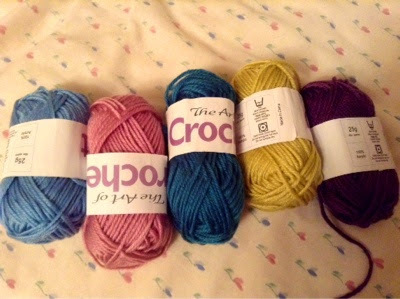 The yarn is now free use for the kids which they love! Great idea, the dogs will love it. I have some wool from magazines too but found the wool a bit ropey however, pets are very grateful recipients. Good on you learning a new-ish skill. If your wrist hurts maybe try a different hold on your hook or one of the hooks with an ergonomic 'handle'. You could even do this with Fimo and have another skill! The dogs will love their new bedding.